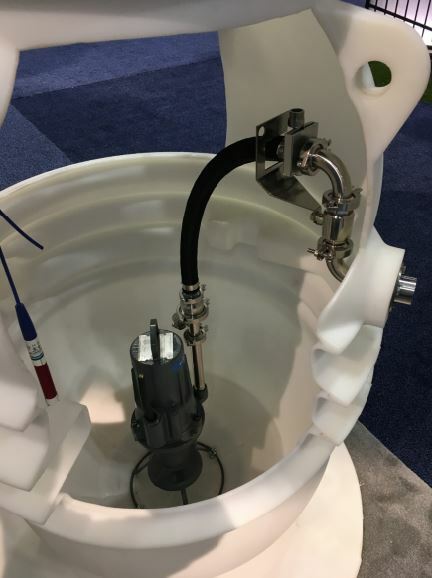 Grinder Pumps -Low Pressure Sewer System LPSS with progressing cavity grinder | JCI Industries Inc.
Flygt Compit polyethylene pump stations equipped with Flygt Progressive Cavity Grinder Pumps. 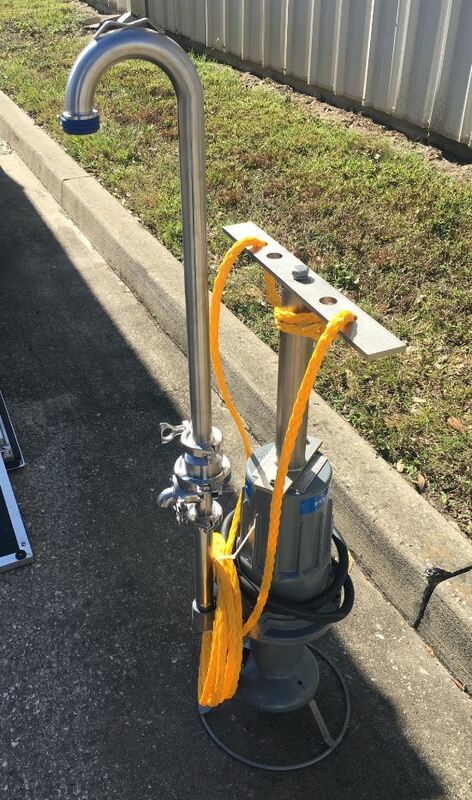 The submersible Flygt pump is equipped with a robust grinder Compit Grinder Pump with 238 gallon holding capacity mechanism which consists of high chrome steel for wear resistance that has been proven over the last 20 years. The grinder has the ability to shred all solids into very fine pieces that are easily passed through small pipe diameters. This solid passing capacity combined with the basins bowl shaped bottom eliminates sediment build up and keeps the station clean. The Compit also has a built in anti-flotation that ballasts the station without the added cost of concrete, saving the customer up to 10% on installation cost. The Compit has an overall storage capacity of 238 gallons, and working volume of 140 gallons versus 80 gallons often provided by other basins being installed today. 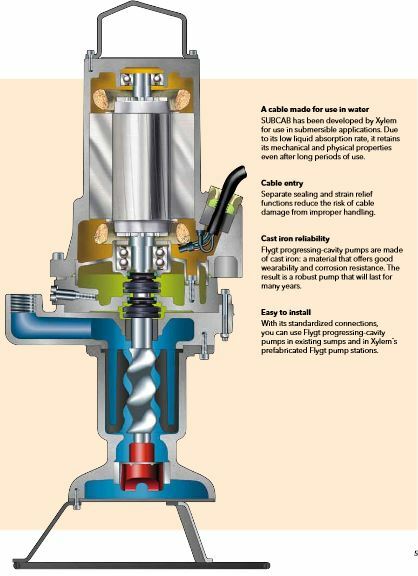 Storage is important in the event of unforeseen Grinder Pumps where power may be out for extended periods of time. This feature also eliminates the need for emergency night visits due to the ability to hold extra storage until personnel start their normal shift. A great solution to a trouble-free grinder is to have a pump with higher torque and to eliminate trouble-some run capacitors that are typically inside competitor pump designs. We recommend a control scheme using a control panel with a small variable frequency drive to transform single phase power to three phase power. This results in higher starting torque and eliminates the need for capacitors that are typically considered a weak link in single phase systems. One of the most problematic occurrences in pre-manufactured residential grinder systems is the location of the single phase start and run capacitors. These capacitors are typically located in the pump requiring the pump to be removed and disassembled for a $20 part. This is very costly to communities and can easily be eliminated with this control package design which will increase efficiency and reduce maintenance hours. The controls are paired with a three point Multitrode level probe for monitoring station level which not only provides reliable level measurement but also reduces labor hours and life cycle cost by only having to maintain a single level device. This level device is also a separate component of the pump leading to easy replacement by not having to remove the pump or replace the pump as is the case with most outdated competitors. The Flygt Compit Grinder pump station has proven to increase efficiency and reduce overall life cycle cost for pressure sewer systems. Contact JCI for direct retrofits of other brands such has E/One™ and other brands. For longevity, demand a pump and motor protected by a dual tandem mechanical seal vs a single seal of competitor. This has been a staple of a submersible Flygt pump valued by customers for years.